North Texas and Garland in particular is a great place for growing edibles the year round. Here are a few plants that I’ve had great success with. This list is a tiny, infinitesimal example of the possibility of growing green year round. 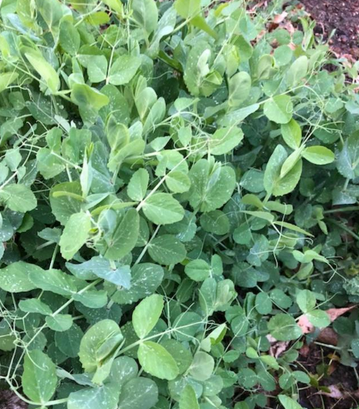 Austrian Winter Peas--The ultimate "win-win" green for a North Texas garden--even if you don't like to garden in the Winter. This lush plant makes a beautiful lush nitrogen-fixing cover crop that you can even eat. The leaves are tasty in a salad or in a stir fry. All you need to do is scatter some seeds and forget it. If you want to eat some, that's fine too. There will be plenty left to turn under in the spring. (Pisum sativum) annual – These are a proven keeper for our North Texas area. They make an excellent cover crop to enhance the quality of the soil as they are nitrogen fixers and they meet one of my basic requirements for all plants—easy to grow. I don’t like to fuss around with plants. They are also known as field peas, one of the oldest domesticated crops, cultivated for at least 7,000 years. Here in North Texas you can plant them anytime from mid-September up through the end of February. Depending on the year they will die out in the spring (March or April). They do not like the heat but are a GREAT plant for your garden for the winter the leaves and young stems are great in salad and some folks like to stir fry them. I planted some seeds at the Garland Community Garden in mid December and they are thriving a month later. Cardoon at the Garland Community Garden. I sometimes wonder if I'm the only person in Garland who eats cardoon. 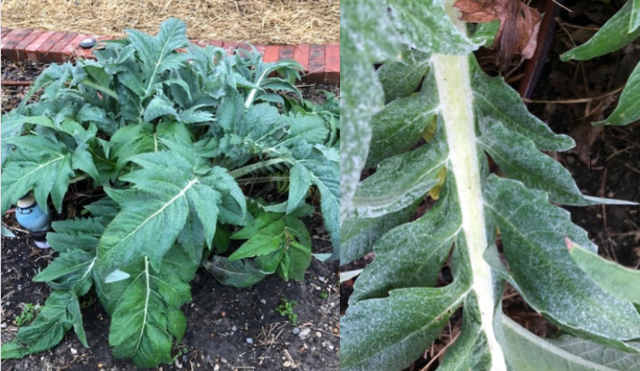 (Cynara cardunculus) perennial– We have been successfully growing cardoon down at the Garland Community Garden for over a year now. Found in the wild along the Mediterranean, from Morocco and Portugal to Libya and Croatia, cardoon is a thistle that tastes like a bitter version of an artichoke with small, prickly flower heads. You can only purchase cardoon at high-end grocery stores. Unlike an artichoke, you eat the stems, not the flower buds. The edible part looks like a celery stalk. I like to eat the stalks raw. The stalks require some preparation even before eating raw. The outer skin of the stalk must be removed and then the stalks soaked in water before consuming. Soak a day ahead covered in the refrigerator. They can then be dipped like celery sticks into hummus. A traditional Italian way is to dip them in anchovy paste. I like cardoon because it is a perennial that looks good in the garden from October through May or June. In the heat of the summer it fades away, only to return again in the fall. Turnips gathered from my garden this morning. 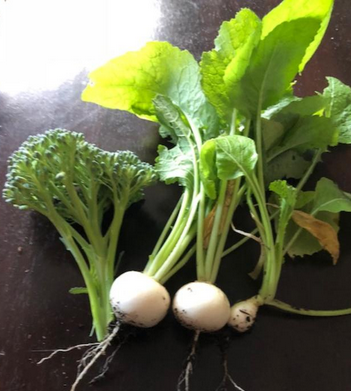 Mustard Greens, turnips, bok choy, kale, broccoli and arugula are some that I grow successfully in my yard as well as at the Garland Community Garden. And of course there is rosemary—always beautiful green year-round plant for your garden. As far as root crops go, I have the best of luck with the smaller varieties. With carrots, the shorter the length of the carrot, the better they do in our heavy clay soil—even if it has been amended. Muscade and Nantes Scarlet are two varieties of carrots that I’ve had great success with. Pigeon pea and pea pods from bush in a pot in my front yard. I gathered them this morning. As you can see, the pods are short and narrow, containing on average five small peas, about the size of a lentil. Although not totally winter hardy, the pigeon pea another lovely showy plant for your vegetable garden or patio from mid-April until the first killing frost in November. Since its domestication in the Indian subcontinent at least 3,500 years ago, its seeds have become a common food in Asia, Africa, and Latin America. It is consumed on a large scale mainly in south Asia and is a major source of protein for the population of the Indian subcontinent. The pigeon pea is a lovely plant for your garden. The peas in the pods from our species are brown and similar in size to a lentil; however other species also make green and yellow peas. 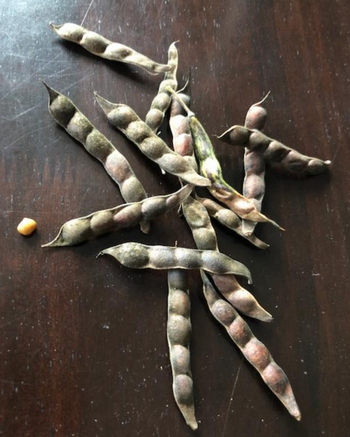 The plants are quite productive; however, it’s labor intensive to shell the peas as they are so small and grow no more than five small peas in their pods. Once again Loving Garland Green, stewards of the Garland Community Garden, are participating in Journey North’s international citizen science project with tulips to measure climate change across the globe. On January 5 at 4PM they planted 50 Red Emperor Tulip bulbs. Garland is now officially on the Journey North's map as Jane Stroud, President Loving Garland Green recorded the planting of 50 Red Emperor bulbs at the Garland Community Garden on Journey North’s website. Hundreds of people across the Northern Hemisphere plant tulip bulbs in Test Gardens. They will record when and where tulips will emerge and bloom in their own gardens and across the globe. The database of this information will in turn help scientists in better understanding the impact of climate change. This citizen science project is also a great opportunity for learning for school children. At least one local Garland elementary school, Parkcrest Elementary, is participating in this project at their school. They are planting tulip bulbs in their school garden. Along with the tulips there will be an associated curriculum and related lesson plans. For example, students will dissect a tulip bulb to learn all about its inside story—the specialized plant storage structure that contains everything the plant needs to survive winter and grow in the spring. Members of Loving Garland Green are planning a Tulip event for students at the Garden as well. This event will take place in mid-February—about the time tulips start peeking up through the earth. Did you know that tulip petals are edible? They have an onion taste. It's hard to imagine, but people also made tulip bread and tulip wine. The Dutch are responsible for the breeding of today's tulips and are the leading exporters of the bulbs - around 6 billion bulbs annually. A period known as "tulip mania" occurred in the1600’s in Holland. It is now regarded as the first economic bubble collapse. At its high point, bulbs were used as a form of currency. Tulips are sweetly scented! And no wonder! The meaning of tulips is generally perfect love. 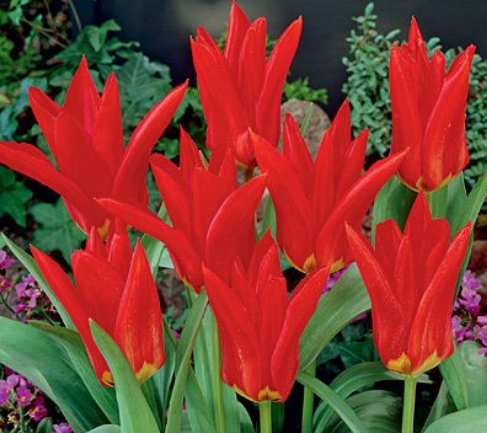 Red tulips such as the emperor tulips are most strongly associated with true love, while purple symbolizes royalty.